NEW YORK, NY–January 10, 2019– Product authentication technology Entrupy today announced that shopgoodwill.com will be implementing the company’s artificial intelligence-based solution to guarantee the authenticity of luxury accessories sold through the nonprofit auction site. Each verified item will receive an Entrupy Certificate of Authenticity and financial guarantee, enabling shoppers to trust their transactions and shopgoodwill.com to drive greater returns from the public’s generous donations. The program is being driven byshopgoodwill.com, the online auction site created, owned and operated by Goodwill of Orange County, and includes deployment of Entrupy’s authentication solution in 125 Goodwill agencies across the United States. Using the proprietary scanner and mobile application, employees in each location can complete the verification process for applicable items prior to listing them for auction. All revenue from these auction sales fund Goodwill’s life-changing programs and services for people with disabilities and other barriers. Developed by a team of technologists and mathematicians, Entrupy’s solution uses machine learning algorithms and computer-vision technology to verify items with a 99.1% accuracy rate. The company’s ever-growing database includes millions of data points from real and fake goods for 100 years of styles from brands including Balenciaga, Bottega Veneta, Burberry, Celine, Chanel, Chloe, Coach, Dior, Fendi, Goyard, Gucci, Hermès, Louis Vuitton, Prada and YSL/Saint Laurent. Authentication of additional product categories will be added in Q1 2019. ”Over the years, shopgoodwill.com has benefited from our local community’s generous donations of high-end items. At the same time, we’ve witnessed ‘Caveat Emptor’ first hand, and that skepticism keeps us from maximizing the full value of that generosity,” said Ryan Smith, senior director online operations at shopgoodwill.com. For more information, please visit entrupy.com and shopgoodwill.com. Entrupy is a hardware-enabled SaaS company that uses computer vision algorithms and microscopy to bring trust to transactions of high-value physical goods. 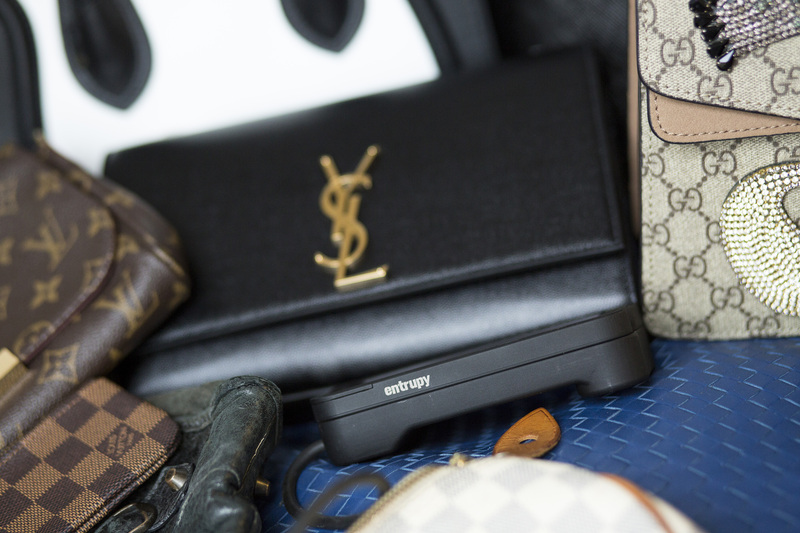 Currently in use by hundreds of secondary resellers and marketplaces worldwide, Entrupy provides the only scalable technology capable of authenticating luxury products from brands such as Louis Vuitton, Chanel and Hermès, among others. The service launched in 2016, following four years of research led by Ashlesh Sharma, Vidyuth Srinivasan and Lakshminarayanan Subramanian, Professor at New York University. Investors include DG Lab Fund, deep learning pioneer and Facebook AI Research (FAIR) director, Yann LeCun, serial entrepreneur and investor Zach Coelius, cloud computing pioneer and Google VP of Infrastructure Eric Brewer, and Japanese venture capital firm, Accord Ventures. The company is privately held and based in New York City. For more information, visit www.entrupy.com. shopgoodwill.comis the first e-commerce auction platform created, owned and operated by a nonprofit organization. The site was designed to provide an engaging online shopping destination that would further the Goodwill mission of putting people to work. Today, more than 120 Goodwill organizations from across the country list and auction unique items on the site, including art, antiques, collectibles, apparel, jewelry, electronics and more. All revenue from these auction sales fund Goodwill’s life-changing programs and services for people with disabilities and other barriers. More than $560 million in online sales have been generated on shopgoodwill.com.since its launch in 1999. This revenue has funded a staggering number of new programs that have served tens of thousands of individuals facing barriers. The e-commerce site was created by and continues to be operated by Goodwill of Orange County. To learn more, visit shopgoodwill.com.